Home Everything else 15 Smart Water Saving Gadgets. These gadgets let you save precious water and let you know your water usage to avoid wastage. Smart Shower: This smart shower is designed to save water; it tracks the water temperature and when your required temperature is achieved, it cuts off the water flow while you are away from the shower. When you are ready to get into the shower, all you need to do is press the button and you get water flow at perfect temperature. Its capable of adjusting the water flow depending on what you are doing. It’s smart to know when you need water, and when you don’t. Using its smartphone app you can track your water usage, habits and trends. Amphiro Smart Shower: Amphiro is the world’s first smart meter for the shower that provides you with real-time data about water and energy usage. It connects to your smartphone using Bluetooth 4.0 and its app gives insight into your water and energy usage. Intelligent Drain by Roca: This intelligent drain by Roca, displays a digital reading showing how much water you’re using. Koolhaus Tap: The Koolhaus tap measures the volume of water used by each of the bathroom fixtures everyday and displays the data on the screen of the tap. PlantLink: PlantLink makes watering simple and efficient. All you need to do is place it in soil, indoors or outdoors and the system will calibrate to the plant’s watering needs using their catalog of over 50,000 plants. These units communicate with its base station wirelessly and transmit data about the soil moisture. The base station sends the data to the PlantLink website and your smartphone. You receive watering alerts via email, SMS, or push notifications. Each base station can connect to up to 64 units at one go. Smart Irrigation Controller: This smart irrigation controller consists of Evecontroller and Evesensors that together makes watering your lawn a lot simpler. It takes of the guesswork out the water scheduling, making smart decisions based on the real data provided by its Evesensors and your local weather forecast. All you need to do is place a few Evesensors around your yard and its controller does the rest. This smart in-ground irrigation system transforms your yard into a real smart yard. Its controller supports up to 16 zones, and the app supports your iOS, Android, and Windows smart device. 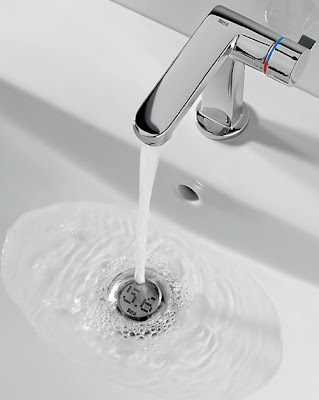 Cook Faucet: This faucet comes with buttons on the tap that are divided into 100 ml, 500 ml and 1 liter and normal. While cooking just press any of these buttons and take the required pre-measured water. Evolve Showerhead: Evolve Showerhead uses ShowerStart technology, the device monitors the water temperature and cuts the flow to a trickle when it reaches a bathing temperature of 95 degree Fahrenheit.‘No More No Less’ Faucet: Designed by Jasper Hou, this faucet lets you adjust the amount of water you’d like to come out before you use it; this quantitative faucet features a screen for control, temperature, and a 30 second on time.Faucet Buddy: Designed by Baek Uyeol, it’s a cool gadget that you can attach to your existing faucet; it features a screen that lets you know the water temperature and the amount of water that is used. Hydros: Hydros is a smart irrigation controller that self-schedules using your specific lawn and garden conditions and weather forecasts to create the most optimal watering schedule. It reduces your water bill up to 60% while keeping your plants healthy and hydrated. 18 Creative and Unusual Headphones – Part 3. 10 Creative and Cool Shower Curtains – Part 3. 25 Clever and Creative Advertisements – Part 3. 15 Creative Slippers and Cool Sandal Designs – Part 2. 18 Clever and Creative Business Card Designs – Part 5.